1 map : ; 18 x 12 cm. From London magazine, or, Gentleman's monthly intelligencer. 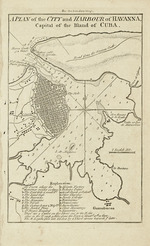 May 1762, v. 31. In upper margin: For the London Mag. LC copy imperfect: Upper margin of copy 2 trimmed removing the phrase "For the London Mag." and a small portion in upper left margin missing. ,v'l Jwrd'y'J ~uanabacoa WtYfYtV . w // l/ww / z/ tA t &K',4 /..